SpaceX conducted a successful static fire of its Falcon 9 rocket on the pad at Cape Canaveral on Thursday, paving the way for a crucial launch on Monday designed to prove the vehicle’s worth in the lucrative communications satellite industry. The task on Monday: to deliver the SES-8 satellite to geosynchronous orbit, a first for the company. The drama revolves around whether engineers have correctly diagnosed and fixed the problem that resulted in the second stage failing to re-light during a demonstration flight in September. If the flight succeeds, SpaceX can begin working through a large backlog of communications satellites on its manifest. A successful flight would also be a major step toward certifying the rocket to carry government payloads. The aborted engine restart on the Falcon 9 test flight was caused when fluid lines for the second stage Merlin engine’s igniter fluid froze after long exposure to cold oxygen, according to Emily Shanklin, a SpaceX spokesperson. “This never happened on the ground, because ambient air kept the lines warm,” Shanklin said in a statement. “We’ve added insulation and made sure that cold oxygen can’t impinge on the lines. 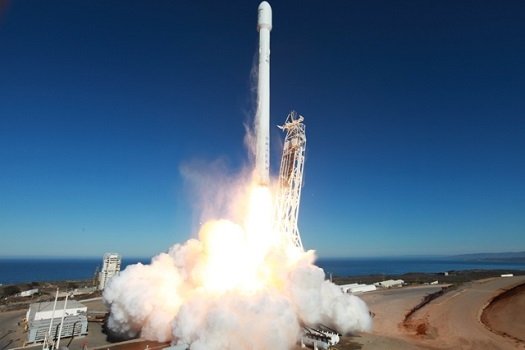 SpaceX’s Merlin engines use pyrophoric igniters with a hypergolic fluid called triethylaluminum-triethylborane, or TEA-TEB. The system allows an engine to restart multiple times on the ground or in flight without refurbishment. Monday’s launch will be the second of the upgraded Falcon 9 v. 1.1, whose improvements over its predecessor include improved Merlin 1-D engines, longer fuel tanks, an improved stage separation system, a payload shroud and enhancements. The SES 8 flight will be the third Falcon 9 launch of the year. The company has plans to launch Thaicom 6 satellite in December, but a date has not been set yet. A nice scoop Doug, this will be a crucial launch for Space X, do you have a time for the launch? According to SpaceX – http://new.livestream.com/spacex/events/2565780 – the launch window opens at 5:37PM EDT.